In may I was fortunate to travel to Serbia, Romania, and Bulgaria. These countries have fascinating histories and beautiful landscapes. I traveled with a group of knowledgeable individuals who were very interested in the history of each country, therefore the discussion was always lively and in depth. We were able to experience great food, they love meat! and beautiful vistas as we traveled thru the countryside in Romania. The hills are green and life is simple in this part of Europe. Much of the land is used for farming and the roads still cut thru the villages. It was a close up view of tradition and local culture. We also were in Belgrade, a modern, busy, growing city. Being from Europe, it reminded me very much of Italy, when I lived there. The people were very friendly and extremely willing to help, whether with directions or suggestions for local restaurants. Our local guide was very young, but his knowledge and passion for his country far exceeded his age. He was my favorite guide! It is great when the local people are not afraid to speak openly about politics and local life. 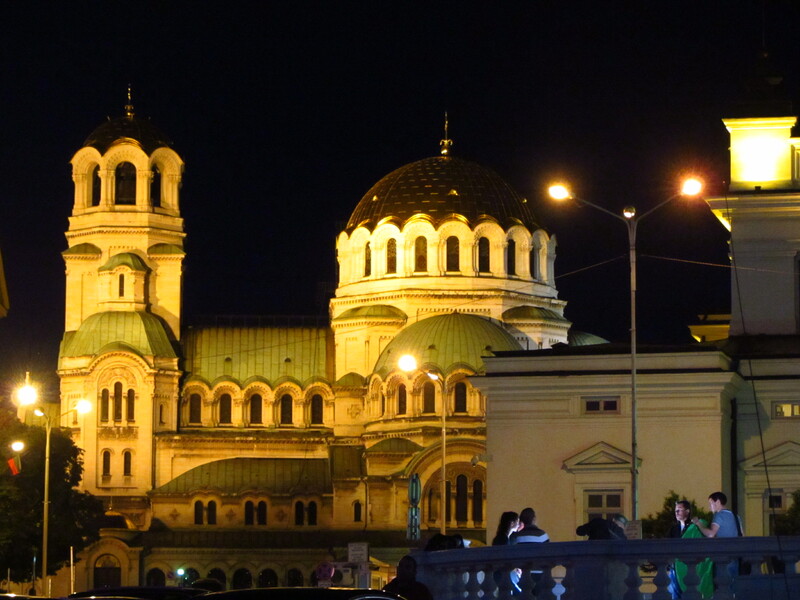 In Bulgaria we mainly visited Sofia, a very small city compared to many that I have seen. It was easy to get around on foot. Many of the local people were out and about on a weekday, sitting in cafes, etc. Everyone was shopping and eating! The highlight of Sofia was Alexander Nevsky Cathedral a stunning structure with a marvelous museum in it’s crypt containing mostly icons. One was more beautiful than the other. Beautifully lit at night, it made for a dramatic view from our hotel and plaza. The gold-domed Alexander Nevsky Cathedral was built in the early 20th century in memory of the 200,000 Russian, Ukrainian, Belorussian and Bulgarian soldiers, who died in the Russo-Turkish War, 1877–1878. It is one of the largest Eastern Orthodox cathedrals in the world. The cathedral’s gold-plated dome is 45 m high, with the bell tower reaching 50.52 m.
Our guide Radu, was from Romania, he interjected his personal experiences during communist times, growing up as a young boy in the city of Bucharest. A very intelligent and kind individual. The last evening the group went to a local restaurant where folk singers and dancers performed. At the end of the evening as I was walking out to the bus, Radu noticed the Romanian president was sitting near the door with his wife, since I was the last one out, he introduced me to Mr. Basescu. Where in the USA can you go right up to the President and shake his hand without major security.. ! The trip was busy but very much worth the time. My fellow travelers were from all over the US and each added an enjoyable element to the experience. If you are thinking of something different, try the Balkans. You won’t be disappointed. You are currently browsing the Travelencounters Blog blog archives for September, 2013.